Developing the The College of St. Scholastica’s face to the world – this is our brand. It is the College’s name, how that name is visually expressed through our logos, our distinctive visual style and unique messaging that extend throughout the College’s communications. To succeed in branding we must understand the needs and wants of our customers and prospects. We do this by integrating our brand strategies through the College at every point of public contact. Our brand resides within the hearts and minds of everyone exposed to the College. It is the sum total of their experiences and perceptions, some of which we can influence, and some that we cannot. A strong brand is invaluable. It’s important that we spend time investing in researching, defining, and building our brand. After all our brand is the source of a promise to our consumer. It’s a foundational piece in our marketing communication and one we do not want to be without. This guide has been developed to create a design system for The College of St. Scholastica brand. It is a series of standardized elements working together to create a family look. The consistent use of these elements is crucial to an overall cohesive look. Follow this guide when working on your projects. If in any doubt, please contact the College’s Marketing Department. The chart below provides a guide to assist you when selecting a file to send to suppliers, or to use as part of your presentation. From this chart you can select the most appropriate format which balances file size with application requirement. Can scale to any size. 72-300dpi. Can scale down without losing quality. 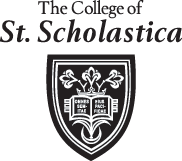 Below you can find St. Scholastica’s Standard Logo, which should be used in most cases. The College also has a set of logos specifically for the Athletics, which are also shown below. In a case when the Presidential Crest, a plain version of the St. Scholastica Shield, a department or location specific logo is needed, please email Mike Cusino in the Marketing Department. The College’s traditional and most commonly used logo. This logo is to be used for applications such as magazine ads, direct mail pieces, posters, flyers, billboards, Web sites and banner ads, etc. when full color is being used. This logo is to be used for black and white applications on a black background where color is not being used. Alternative option if the Standard Logo cannot be used and a square format logo is required. This logo is to be used for the same applications as the standard logo but when a square format is required. This logo is to be used for the same applications as the standard black and white logo but when a square format is required. Two accepted logo treatments either of which can be used to represent the Athletic Department or individual athletic teams. Did you know this about the shield of the College? 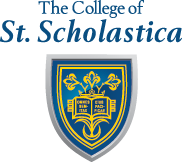 As part of its logo, The College of St. Scholastica utilizes the Benedictine shield. Benedictine values are the cornerstone of the learning that happens at the College. In its original form, the field is blue. Upon this field is a silver lily, blooming with three flowers symbolizing the three Persons of the Blessed trinity. The base of the lily is enclosed by a silver crescent, the heraldic symbol of the Virgin Mary, and likewise the purity of Christian teaching. A golden crown of the medieval regal shape in heraldry encircles the lilies above, recalling the dedication of the Chapel to the Queen of Peace. Using the Shield as a graphic element. The Shield on its own can be used as a graphic element i.e. as a background “watermark” but is not sufficient in this form as an official representation of the College logo. A form of the College logo as described on previous pages should always appear on any project that features the Shield as a graphic element or enhancement. 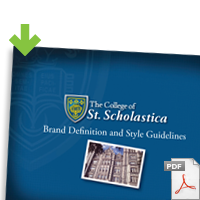 For a comprehensive list of proper logo and brand treatments download the St. Scholastica Logo Usage and Brand Guidelines PDF. This guide not only contains logo treatments, but font and layout guidelines as well. As a supplement to the brand guidelines offered above, we've complied a set of editorial guidelines. This document addresses many common grammar, style, and usage questions and provides answers that are specific to St. Scholastica. We have also created a CSS branded PowerPoint template for your convenience, which is available for download below.